PRO Two-Page-Per-Day Planning Pages are designed for use with Day Runner Pro Business System Planners. Structured planning is ideal for the person who desires more function and control. Dated yearly refill ranges 12 months from January to December. Two-page-per-day spreads feature ruled, quarter-hourly appointment times from 8 AM to 5 PM; half-hourly appointment times from 6 PM to 7 PM; prioritized activities; expense tracking; ruled daily notes; numbered weeks; count of days/days remaining; holidays; and past, current and future months reference. 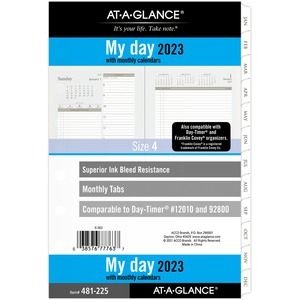 Planning pages include monthly overview tabs, an event calendar and four-year overview.